One-line summary of the current situation: Cheats won't do. You cannot immigrate into Norway this way unless you have real and verifiable reasons to ask for political asylum. The Norwegian authorities are really good at checking this right now (2004). Asylum in Norway - a chapter from Karen Dzhangirov's book "Asylum in Canada". Contains detailed description of handling asylum-seekers in Norway and the standard workflow. Reader's comments. Unfortunately, information contained in this text is partially obsolete. Rest of links listed in chronological order, newest on top. UDI wonders why the flow of Chechen asylum-seekers into Norway has risen sharply, while there is no such rise in other European countries. Applications from Chechens are temporarily put on hold until the handling practice is re-evaluated by UDI (October 2003). 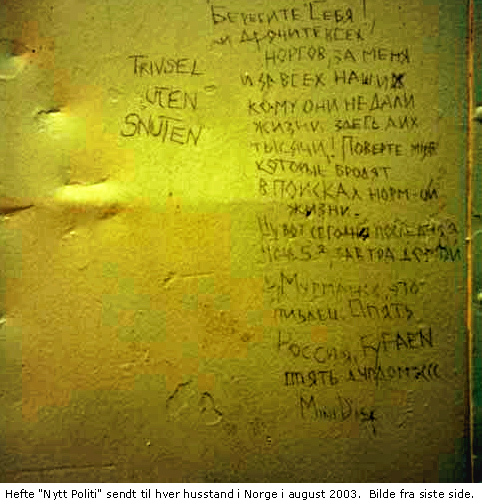 A curiosity: obscene graffito made by an asylum-seeker from Murmansk was printed on the back side of the information booklet from Norwegian Police and mailed to each household in Norway (August 2003). A Norwegian I knew sighed after watching the film and said: "They had a good vacation at our expense". Norway does not like self-invited guests - earlier article. View the video. If you wonder how the woman intentionally blurred in the reportage looks like, here is her face without blur (she's from "Silver World" agency). Frankfurter Rundschau about this (translation into Russian). There used to be many videos in the listing below. Unfortunately, after TV2 revamped its WebTV service, they are no longer available on-line. However, we've copied the most interesting video, Russians coming documentary. The Ministry of Local Government (Kommunaldepartementet) invites one Russian and one Ukrainian TV-channel to film one of the worst Norwegian camps for asylum-seekers. Asylmottak in Hoboel is a tent camp for people whose applications were classified as openly groundless. They live there for about three weeks and then are sent back to the home country. Food quality and living conditions are reported to be low. After the application is refused for the first time, those who choose to file a complaint no longer receive any pocket money. One of UDI's concerns is that many Russians get into debt or sell their apartment to pay a large sum to an "asylum travel agency", only to be sent back from Norway few weeks later. This results in personal tragedies, and also in sensible financial loss to Norway due to the high number of asylum seekers. Out of about 25 Russians in asylmottak, only one agreed to be interviewed by ORT. About 20 Norwegian journalists watched the two Russian colleagues working. The whole issue may be discussed with the Russian President when he comes to Norway in November 2002. Norwegian lawyer Terje Tune is caught preparing false histories for asylum-seekers from ex-Soviet states. Terje Tune was earlier employed at UDI; now he is receiving state subsidies, and tops it off by taking extra cash from his clients. The director of UDI Trygve G. Nordby said all the cases where he was involved would be re-evaluated. 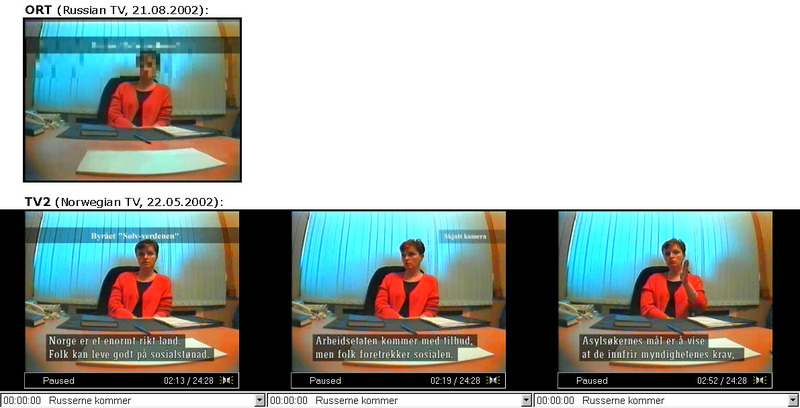 For this story, TV2 used a Russian asylum-seeker with hidden camera (Aleksander Voda). All publications from TV2 about this scandal; see especially Fellow asylum-seekers angry at Aleksander Voda. The video was filmed by a journalist with a camera hidden in his dress. He bought services from one of asylum travel agencies ("Vera") in Moscow and travelled the whole way through Europe and Sweden to Norway. This is a must-see. Visa applications from "asylum travel agencies" turned down flat - article in Aftenposten. Summary. The number of asylum-seekers from ex-USSR states more than doubled in 2001 comparing to 2000. Unfortunately, Norway cannot close the firms that openly advertise assistance in moving into Norway. The Norwegian consulate in collaboration with consulates of other Schengen states try to identify these agencies and refuse visa applications. The Directorate of Immigration (UDI), in turn, will speed up processing of "openly groundless" cases to three months. Summary of articles published in the following months. In 2001, Norway set a record by issuing residence permits to approx. 25% asylum seekers from Russia and Ukrainia. This caused even bigger influx of would-be refugees from these countries. "Asylum travel agencies" offering assistance in travelling to Norway and "proper training" flourished. It costs Norway about $50,000 to settle one refugee. Norwegian politics want to stem the flow of refugees and tighten the rules. Site of the UN Refugee Agency published a detailed report on Refugees and Asylum Seekers from the Russian Federation (PDF, 2.5MB). The statistics in it contains country breakdown for 1990-1999. According to these data, at least 19 out of 20 Russian applicants for asylum in Norway were refused. The Journey to Sweden to Get a Car, or Adventures of Belorussians in Scandinavia. Comment. I'd like to oppose the optimistic tone of the article and try to estimate what this half-year journey cost to a Swedish taxpayer. In the end, you'd think it would have been cheaper to Sweden to issue a couple of new cars instead of two tourist visas to these "adventurers".